There's a recently-revealed blog called, "A Pack to be Named Later" upon which I am a contributing member. I bought four of these packs to post over there, and each pack will be displayed on a random date in the future. In the meantime, I thought it was an appropriate set for inclusion on this blog! 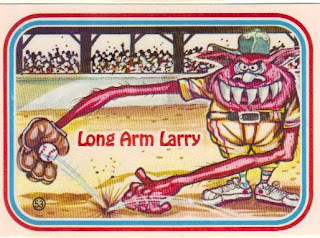 After all, we're talking VERY weird cards and baseball. It's a match made in... Well, let's just get to the set, shall we? 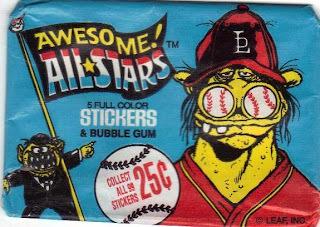 I can honestly say I have no desire whatsoever to put this 21-year old gum anywhere near my mouth. The powder is still very fine and very messy. I'm sure I'll be cleaning my scanner for weeks to come. 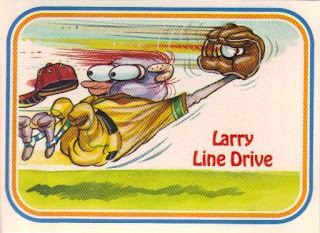 Larry Line Drive and Long Arm Larry... I guess they couldn't have very well used "Luke," now could they? 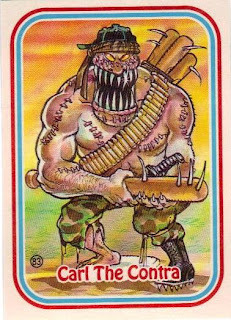 You couldn't get away with a character named "Contra" nowadays, I don't think. 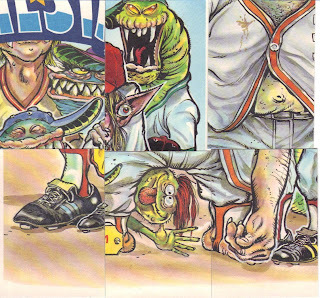 Collect all the pieces and have yourself a big-ol' time completing the puzzle. 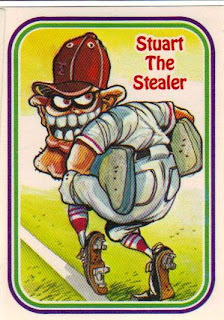 As I said, at least it's RELATED to baseball, right? The gum looks like one of those images of lungs they show on cigarette commercials intended to scare the sh-- out of you. Showed the post to my 7 year old who wants them like NOW. Told him that we will have to look into a time machine. Oh my gosh, I've been looking all over for packs of this stuff for my blog. 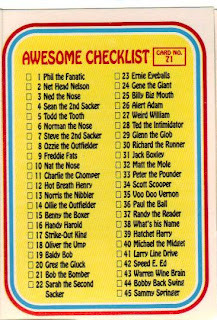 I have at least 1 full set of these cards and 3 unopened packs of the cards each sporting the different wrappers they were sold in. I also can get ahold of the box containing all of the wrappers of the opened cards and original unit box they were sold out of. p.s. 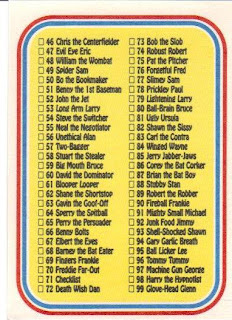 #29 (Henry the Horrible) looks like Howard Kossel..in a vampire outfit! Some on sale on ebay!